When I was young one of my favorite side dishes was rice pilaf. It came in a slim box with a portion of rice and a sachet of spices, dehydrated chicken stock – and goodness knows what else – all set to prepare with water on the stovetop. The results were addictive and exotically flavored. My brothers and I would fight over who got to finish the bowl on the dinner table; one box was never enough. These days I make pilaf from scratch – and you probably do, too, without realizing it. The principle behind pilaf is that rice, or another grain such as bulgur, is sautéed then steamed in a flavorful broth, along with a few aromatics such as onion, garlic and spices. When it’s ready to serve, the rice is fluffed to separate the grains, and fresh herbs may be added for flavor and adornment. So before you reach for a box of pilaf in the supermarket with a long list of ingredients, remember that it’s really quite easy – and much cheaper – to make your own from scratch. 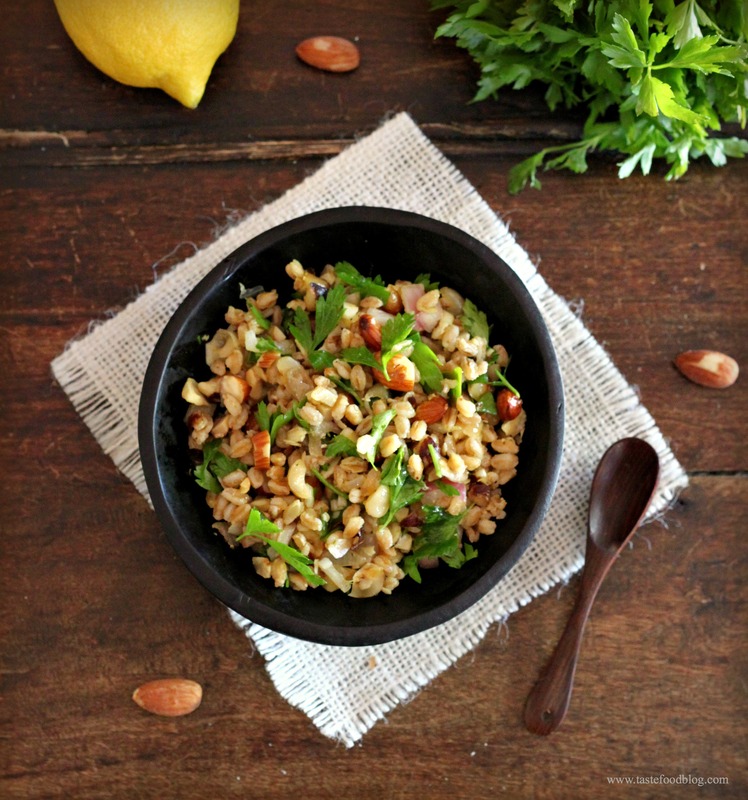 This recipe replaces rice with farro, and includes toasted almonds, lemon, mint and parsley. It makes a hefty pilaf, which is nutty, fresh and packed with protein and nutrients. Depending on how salty your stock is, adjust the amount of salt to taste. Serves 6 as a side dish. Heat 1 tablespoon oil in a medium saucepan over medium-high heat. Add shallot and garlic and sauté until shallot begins to soften, 2 minutes. Add farro and stir to coat the grains. Carefully add the stock (it will bubbly vigorously), salt, pepper and cayenne. Bring to a boil, then reduce heat to low. Cover and simmer until the farro is tender but chewy and liquid is absorbed, about 25 minutes. Remove from heat and fluff with a fork. Transfer farro to a bowl. Add 1 tablespoon olive oil, almonds and lemon zest and stir to combine. Cool slightly. Before serving mix in parsley and mint. Serve warm or at room temperature. I have a bag of farro that I have yet to open – your pilaf sounds perfect. I’ve never cooked with it. 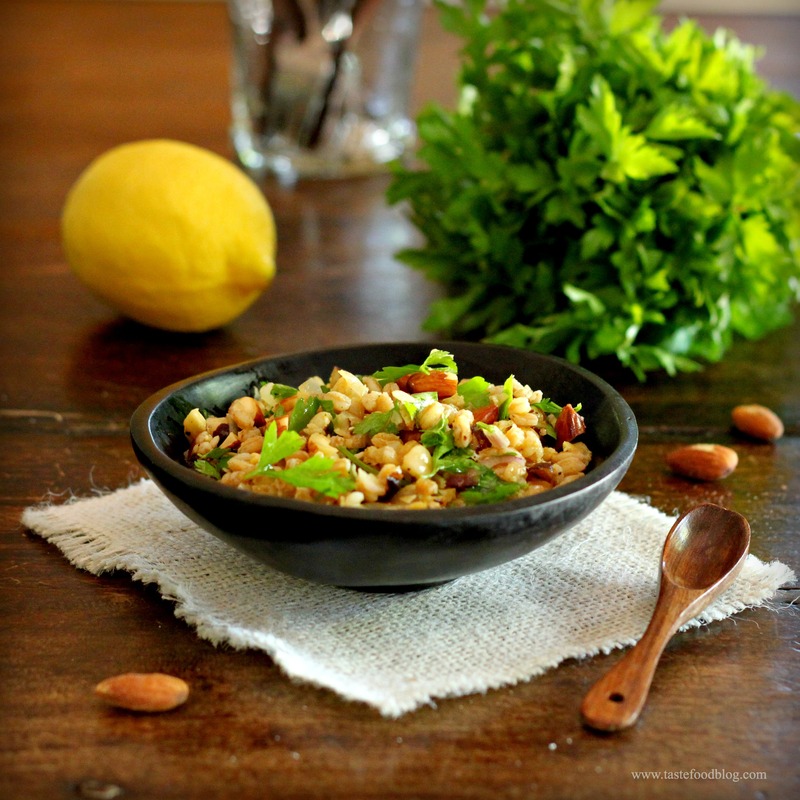 Farro pilaf is a fantastic dish… grown up, sophisticated, healthy, it has it all! Lovely recipe. I use stock to make Chinese congee – rice porridge – it adds such depth of flavour! This is such a lovely summer recipe dish, thanks! Farro is my favorite grain. I love your pilaf and those flavors are so delicious hot or even cold from the fridge. Beautiful photo! How’s the new house? Settling in – please stop by if you are in the area! I love pilaf too but I’ve never had farro. The almonds are a great addition. No worries if you can’t find farro. This is good with rice, too! Hi Lynda, I like that you’ve used a different grain in this recipe… I would love to try it with barley or buckwheat even. And as for the packet stuff, I think sometimes even though it may be cheaper, it’s what’s in those boxes that worries me (additives, etc). Much tastier and more satisfying to make at home. You are so right about the additives. I order farro when we are in Italy but I have never cooked it a home. Your recipe has me thinking that I must buy some farro. Great sounding pilaf. I loved that boxed pilaf! Ah, memories. Yours with farro looks divine. I am crazy about farro and we get some amazing farro grown locally here – I’m always looking for more ways to enjoy it. Thanks for sharing your recipe. Have a great weekend! Beautiful! And I’m in the mood for farro, so this is perfect. I loved that boxed rice pilaf too. I bought it in all kinds of flavors constantly. So simple, fresh and brilliant….I love it! I remember those boxes. I found them to be delicious back in the day, but i definitely stray from those aisles in the grocery store now. I ate a lot of farro in Italy and haven’t bought any since we moved back to the States. I think a year is long enough and I should go procure some! I love the addition of parsley and mint!